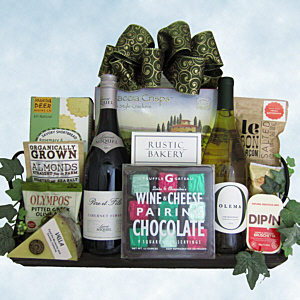 This wood tray with metal hinges and handles is loaded with delightful gourmet foods and delicious snacks. The two great wines: Laurent Miquel Cabernet Syrah and Olema California Chardonnay, pair perfectly with the Wine & Cheese Pairing Chocolate. The box has three flavors of Belgian Chocolate, such as the Dark Choclate with Roasted Pinenuts that is made to go with Chardonnay (or enjoy by itself, we won't tell). There are plenty of other favorites such as Organic Almonds, Vella Dry Jack Cheese, Dancing Deer Savory Shortbread with Rosemary and Pink Sea Salt, Rustic Bakery Pesto Parmesan Cheese Coins, Virginia Peanuts, Olympos Pitted Olives, Foccacia Crisps, Le Bon Garcon Salted Caramels, Dipin Pepper and Artichoke Bruschetta. Time for Wine!